I-485. During construction of the new roads, local traffic will be redirected to Walkers Ferry Road, Mt. Olive Church Road, and Dixie River Road. Before traffic is relocated, Mt. Olive Church Road will be repaved and widened. Each meeting will last from 6:00 P.M. to 8:00 P.M. Staff will give a brief presentation at 6:30 P.M. and will be available to answer questions before and after the presentations. 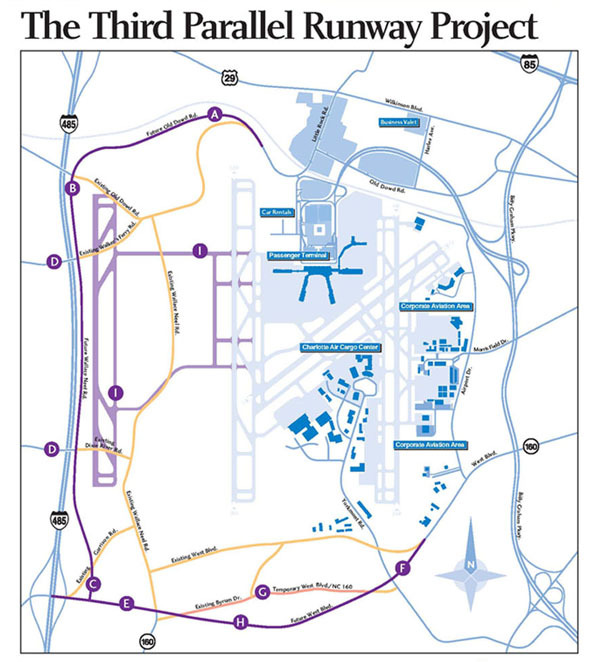 The map below (taken from the Charlotte-Douglas International Airport web site) shows relocated Old Dowd Road (A), relocated Wallace Neel Road (B and C), a new section of West Boulevard (E), and relocated West Boulevard (F and H). Areas west of I-485 will have access to the new Wallace Neel Road across overpasses for Walkers Ferry Road and Dixie River Road (D). Completion of the relocations of Old Dowd Road and Wallace Neel Road and the extension of West Boulevard to I-485 is scheduled for completion in summer 2008. The relocation of West Boulevard east of the existing Wallace Neel Road will be completed later, once funding is in place. For more information on the road relocations and the runway expansion, visit the airport's Runway Construction Homepage or attend one ofthe workshops.